What a glorious week right? I’ll save you the sob story of how I have been confined to my desk for most of it. I know for a fact that future Lexi will be exceedingly grateful for this small sacrifice (indoors in the face of British sunshine!) in the greater quest to finish a thesis draft by the end of June. The next chapter in my thesis is about food and nutrition education so I’ve spent the week re-reading field notes on classes on healthy eating, getting excited all over again about children learning how to make bread in class, and discovering the really, truly, fantastic food art that was made by some children I worked with (I honestly want to have some of it on my walls). But I did find time to make something for you lot too. A lime and buttermilk tart, to be precise. I’m not sure about you but the chances of having both limes and buttermilk at the ready in my kitchen is slim, so when I was perusing through Margot Henderson’s book, You’re All Invited, I decided it was obviously the universe telling me to make this particular tart. The book isn’t that new – it came out in 2012 – but it’s new to me. And this tart is a winning combination of sharp buttermilk with smooth vanilla and tangy lime all entangled in custard-meets-sponge form (almost like a lemon pudding that is part sponge, part custard/sauce). It feels a little like proper summer eating when consumed ever-so-slightly cold. I thought when I was making it that it might be useful to talk about blind baking. I haven’t done much on pastry advice on this blog, mostly because I don’t consider myself an expert but I had a conversation with one of my uncle’s a few weeks back about soggy tart shells and that prompted this thought process. I almost always blind bake tart shells before using them. It helps prevent soggy bottoms and ensures you have a crisp finish on your pastry case all the way through. Any recipe that has an egg-based filling and is therefore cooked at a lower temperature, should first have the shell baked blind as the oven won’t be able to cook the pastry and set the filling at the lower temperature and the end result is partially cooked pastry. Yuck. Blind baking is simple. You line the tart shell with pastry, rolled out as thin as you dare. You should need to take a deep breath as you roll it up and then re-roll it into the base of the tart tin. I then almost always refrigerate this, even if only for 20 minutes, to give everything a chance to relax again. The oven is pre-heated to 180C. 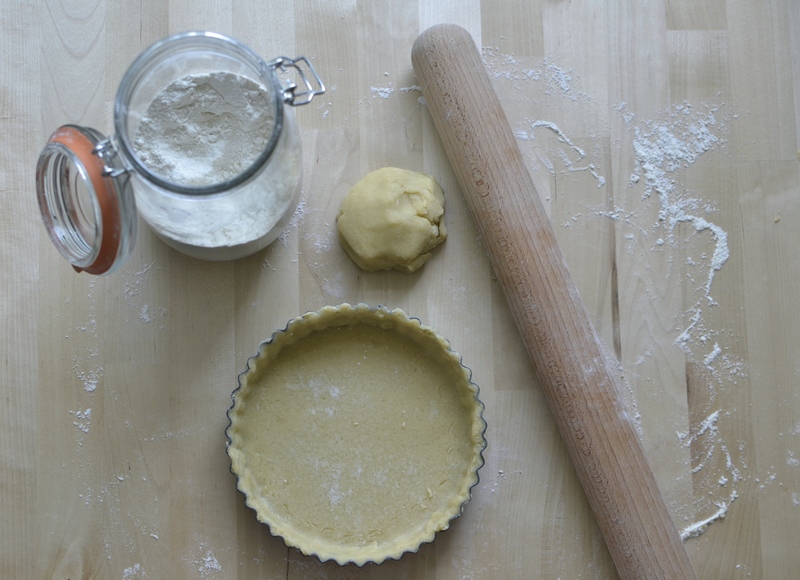 Place the tart case on a flat baking tray – this makes it easier to move it to the oven, especially once the filling has gone in. Line this with baking paper and then fill it right to the brim with rice or baking beans. (I always use rice and have a tin specifically set aside for rice for baking.) You need to fill it to the top otherwise the tart may be tempted to shrink around the sides, something that will make you want to cry. Bake the tart shell for 20 minutes. Take it out of the oven and carefully remove the rice/beans and baking paper. Return it to the oven for another five minutes to dry out again. The result should be a slightly golden tart shell that is dry all the way through. Any cracks can be brushed with egg white to seal them and then your filling can be poured carefully in and returned to a cooler oven (usually 160C).